There is not much more special in life than a reunion with the one you love. I have been capturing all of the greatest moments of Kaylin and Luke's life since they met... but I tell ya, these military homecomings top everything. Usually we have their girls in tote with us for the big reunion and those moments are so sweet, too, of them getting to see their dad for the first time in 7, 8, sometimes 9 months. This time was a little different, and bit more romantic for them, since we were kid-less this time, and the reunion was just for Kaylin and Luke. Their marriage of 7 years is even more incredible as their love on their wedding day. It's been an honor to watch them grow as a couple, grow their family, grow in their faith, grow in their careers, grow as a couple, and do it all with God at the center. The amount of months they spend a part because of Luke's job in the marines in unfathomable to me, yet they handle it with so much grace. I have so much admiration for these two. I love getting to capture these homecomings for them. The reunion is so incredibly special each and every time. 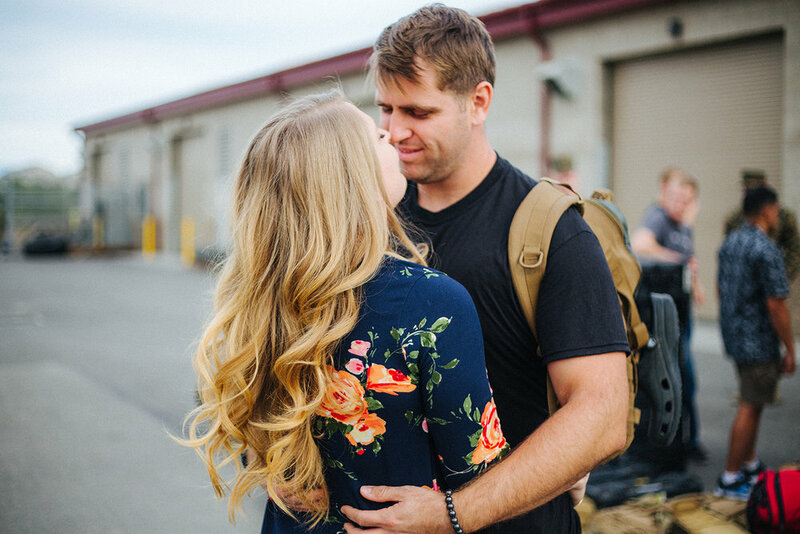 I am grateful for how amazing of a husband Luke is to my best friend, and I am even more grateful that he is back safely and in his wife's loving arms. Welcome Home Luke, thank you for your service and you are so, so loved!